Don’ forget about the mini ! especially when its in stock and possibly the fastest Mac ever ….Octobers autumn announcement scored highly with a fantastic new super thin Apple iMac, (available to lease from us at £9.80 + VAT per week); an upgrade with a faster CPU for the iPad, giving us the 4th Generation iPad at only £4.55 + VAT per week and finally the iPad mini which will inevitably be hugely popular. All of these will be available on a flexible lease basis through HardSoft. However, something that people may have missed, there was also a revision of the Apple Mac mini, a computer in the opinion of us at HardSoft that is greatly overlooked and overshadowed by the new iMac range. Remember the Mac mini doesn’t come with a screen/keyboard or mouse but these can be added for a small extra cost per week on lease! The Apple Mac mini is exceptionally small and expandable – unlike the iMac. Taking you through the range… there is the entry is the Mac mini with i5 CPU at only £4.50 + VAT per week; an amazing price to enter the Mac market. But for a more serious user things heat up with the next model; which uses the Intel Quad Core i7 2.3ghz CPU, and can be leased for only £6.10 + VAT a week. A Popular upgrade on this machine is the upgrade this to 16GB RAM adding only a extra £0.75 + VAT per week. You can also add an Apple 27” Thunderbolt screen to give a complete desktop solution for only £14.20 + VAT per week on a 3 year Flexible lease. Both exceptional value and giving real power. If you’re not convinced by a cheaper price that this is a true alternative to the Mac mini then MacWorld this week road tested the new Mac mini. Customised to include a 2.6GHz Quad-Core i7 processor, 16GB RAM and the 1TB Fusion drive. The Mac mini is one of the fastest Macs the Macworld Lab has EVER tested. Its over fifty per cent faster overall than the standard configuration Mac mini. The Fusion Drive technology instead of the 5400-rpm hard drive was three time faster to complete a copy file and uncompress file tests as the Fusion Drive did in the i7 Mac mini. The i7 Mac mini’s combination of extra RAM, a speedy SSD, and a quad-core Core i7 processor was so good, its performance earned a Speedmark 8 score just below the 15-inch Retina MacBook Pros. They have the same 2.6GHz quad-core Core i7 processor. The i7 Mac mini was actually faster than the Retina MacBook Pro in a few tests, like the iPhoto, iMovie, and Aperture.The Fusion Drive technology (instead of the sata 5400rpm hdd) was three times faster to complete a copy file and uncompress file test. In the absence of the Apple iMac 27” which isn’t due until December this bundle gives users a real alternative to use now.The i7 Mac mini is expandable with a choice of SSD & Hybrid drives and up to 16GB Ram. 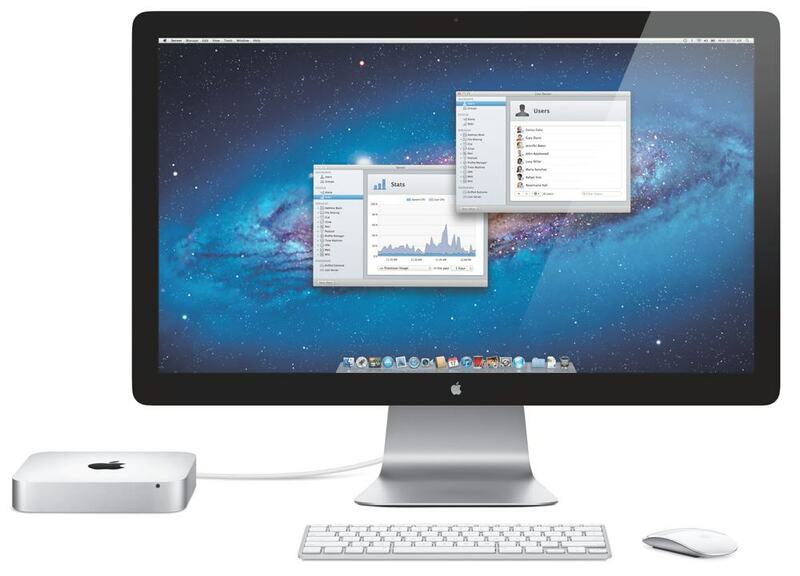 Finally, Apple offer the Mac mini Server with i7 CPU for only £ 7.80 a week on a 3 year lease from HardSoft. Add this to your business if you have a few users for central file sharing, data backup and security. A must really if you want to protect your data and your business. And with our expertise we can install and configure your Mac mini Server onsite for a small extra weekly cost. If you cannot wait 2 months for the new 27″ Apple iMac and you want a great solution, then contact us now for a quotation on the Apple Mac mini range. Call us on 020 7111 1643 or email sales@hardsoft.co.uk. HardSoft leasing has been operating for many years and as an Approved Apple Reseller can be confident of the right Mac solution but also our years of experience in business financing means we can tailor the lease to your cash flow and needs. We can defer payments as well if it suits.